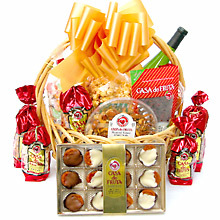 Welcome to Casa de Fruta's Make Your Own Gift Basket Page! You can personalize a gift basket for a special friend or relative. Choose your items, we select the appropriately-sized basket, artfully wrap it, attach your gift message, and ship it to the lucky person you designate. Please note: making your own gift basket constitutes an entire order. Our shopping cart system will not allow you to select additional items not meant for the gift basket before or after making your own gift basket. Once you "Make Your Own Gift Basket" and check out, you can purchase additional items in a new and separate order. Step 2 – Add dried fruit, nuts, wine, gourmet goodies, candies, chocolates, gift bags or gift tins to your gift basket. Step 3 – Proceed with check out and remember to fill out a gift message! Note: Order additional basket(s) on separate orders. 12/16/2011 – Hi, how do I add things to the "Make Your Own Gift Basket"?